Light can vary dramatically in spectrum even if it is the same color temperature. Light from LEDs and fluorescents is very different than incandescent lights. Even if they look the same on the surface. Whenever there is an article published on blue light, someone will leave a ignorant comment. Usually they are saying that the article is total crap because LEDs are now available in soft colors. What they don’t know is that visible light can differ dramatically even if it appears to be the same. Take a close look at this chart from the Department of Energy. 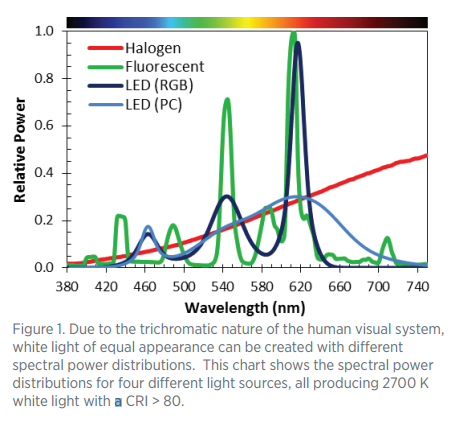 It compares the light spectrum from four different 2700K “soft white” light sources. Halogen, compact fluorescent, and two types of LEDs. We can see the dramatic difference between the halogen incandescent and all the others. 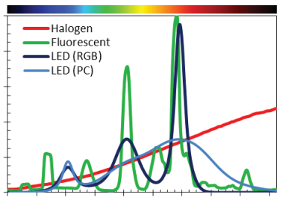 Notice the peak in the blue part of the spectrum for both types of LED lamps. You’ll also notice that incandescent lamps put out huge amounts of red and infrared light. Visually they are very similar but dramatically different “under the hood”. Your eyes contain specialized receptors (Photosensitive retinal ganglion cells) that provide no visual information. They send information about the amount of blue light in the environment. This information is reported to the suprachiasmatic nuclei (SCN). Also known as the body’s Master Clock. These receptors are stimulated by all light but are vastly more sensitive to blue light. Light intensity and color spectrum calibrate the body’s master clock. Interesting fact: There are people who are completely blind that still have perfectly functioning retinal ganglion cells. Dispite having no vision, their eyes are taking in information on lighting conditions! All things being equal, CFLs and LEDs stimulate your retinal ganglion cells more than incandescent lamps. This is a problem. Though out all the millions of years of life on earth, lighting came from back body radiation. The sun. You know what else is a black-body radiator? Incandescent lamps and fire. Black-body radiation is electromagnetic radiation emitted from heat. Part of that radiation is visible light. A much greater portion is infrared light. You can read more about black-body radiation on Wikipedia. If we do away with incandescent lighting, our only significant exposure to far-red infrared light will be from the sun. Unfortunately we spend a most of our lives indoors. That is not likely to change any time soon. The question is: What are the consequences of removing far-red and infrared light from our environment?